A benchmark score logged on Sunday with Primate Labs' online Geekbench reportedly details the specifics of Apple's iPhone 5, with the new smartphone outperforming the average scores of every iOS and Android device on the website. 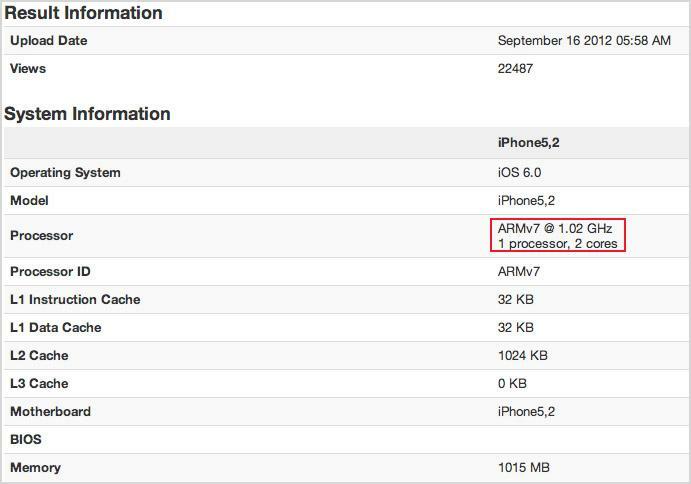 The online benchmarking site reportedly logged a score of 1601 from an "iPhone5,2" that was running iOS 6 on a dual-core ARMv7 processor clocked at 1.02GHz with 1GB of RAM. While it is not impossible to spoof device identifiers, the specifications line up with previous speculation that Apple's A6 SoC boasts a full gigabyte of DRAM and leverages a an ARMv7 CPU with custom-designed cores. If legitimate, the iPhone5,2's score eked out the highest-performing Android devices, including the Asus-built Nexus 7 tablet and Samsung Galaxy S III. In comparison, no iOS device has surpassed the 800 mark, as last year's iPhone 4S netted a 631 while the third-generation iPad (CDMA) scored 734. When the iPhone 5 was announced on Sept. 12, Apple Senior Vice President of Worldwide Marketing Phil Schiller said the new A6 chip doubled both the processing and graphics performance of the legacy A5 SoC. Also promised was an increase in battery life resulting in 8 hours of 3G or LTE talk time and web browsing. The quoted performance bump and increase in power efficiency lead some to believe that Apple's A6 would be a quad-core CPU built on Samsung's 32nm fabrication process, however Sunday's benchmark data suggests the chip holds only two processing cores running at a higher clock speed than the A5 processor. Although the exact configuration Apple is using to achieve the huge performance gains while improving on energy consumption is unclear at this time, a full teardown and analysis of the iPhone 5 is expected to yield answers this week when the device officially hits stores on Friday. Some customers who pre-ordered the handset on Sept. 14 are reporting that shipments have already begun ahead of launch-day deliveries.